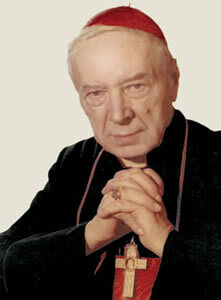 The patron of the school is a great Pole, Cardinal Stefan Wyszyński, often called the Primate of the Millennium. 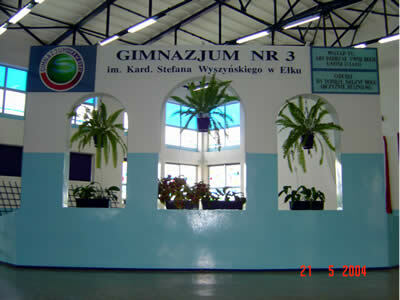 The school is called Granatowe Gimnazjum ( the navy blue lower secondary school) due to the decoration of the school building. 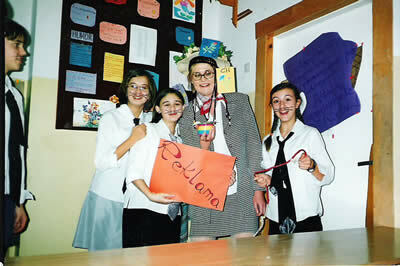 It is called Granatowe Gimnazjum ( the navy blue lower secondary school) because of the school uniforms' colour. It owns its logo and its unique mission. COME IN TO MATURE YOUR SOUL, MIND AND BODY. GO AWAY TO SERVE GOD, HOMELAND AND OTHER PEOPLE. It has got its own song , the school anthem. Seek to discover ways no human knows. The soul of man expands within the new. And God still bigger grows! And soon forgets the dreams of older days. And join the making of new eras' lore. The House of the Future raise! But trample not the altars of the past! Although you shall much finer domes erect. And them you owe respect! 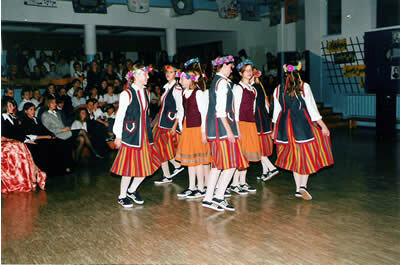 It creates its own traditions and it also upholds national, local and family ones. The staff are the teachers who seek for new solutions, avoid schemes ,are eager to cooperate, spend their effort on the students and are always kind and open-minded. The great youth study and also spend their time there.